This is the story of a dresser. 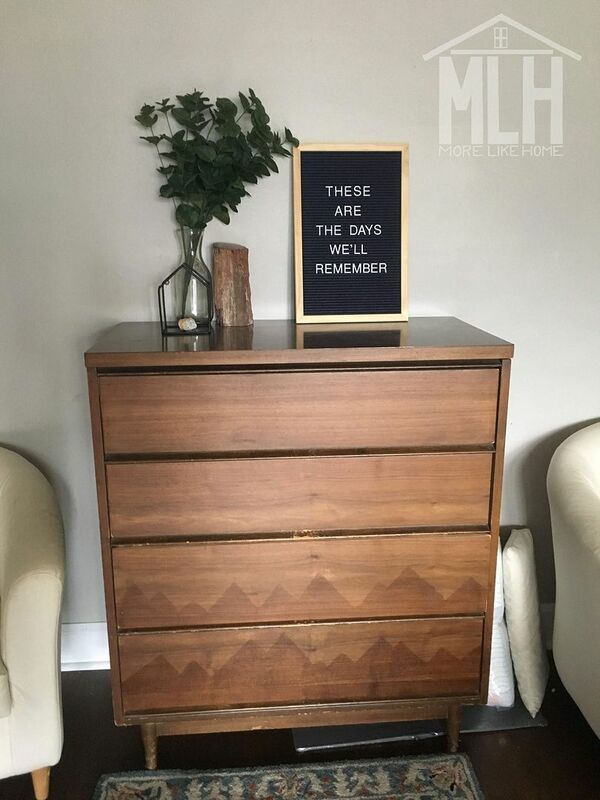 I don't know where or how long ago its story begins, but I can tell you how this dresser came to me. A free, broken-down, ugly little duckling. And I can tell you how it came to be one of my very favorites. 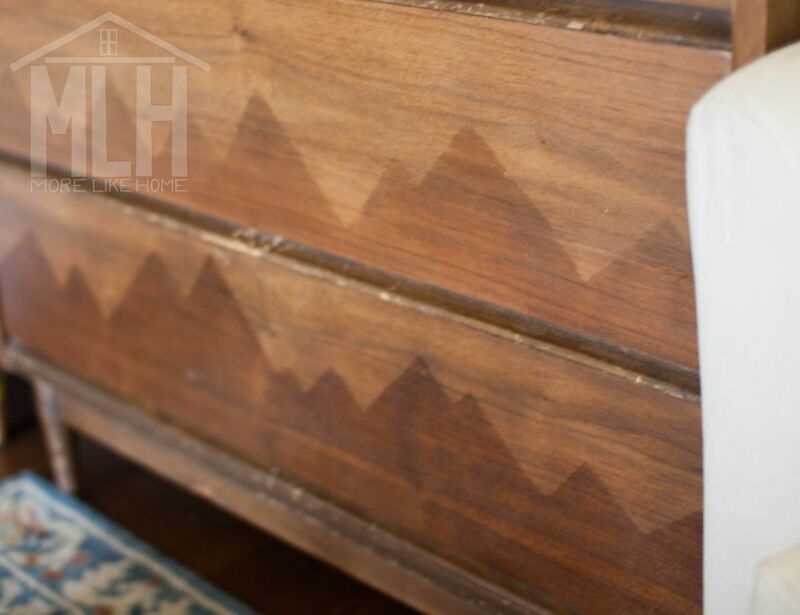 Along the way I'll show you how to create this subtle-but-stunning mountain silhouette pattern on your own favorite dresser! Perfect for any adventure or wanderlust fans out there. Spoiler: this is exactly how it became my favorite. And I'll even show you how to repair a dovetail drawer. So get ready for lots of DIY goodness! 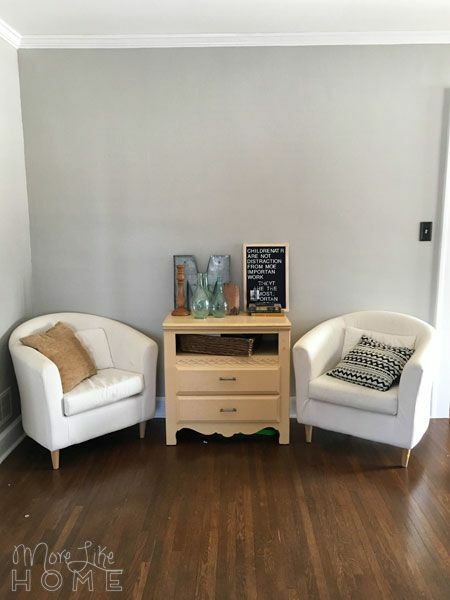 Several years ago a friend called me up with an offer I couldn't refuse - she was moving and had an old tumble-down dresser that wasn't worth dragging along. The paint job was rough and one drawer was in pieces but she new I loved a good project piece. I could have it if I just got it out of the way. This is how it looked once the drawer was fixed... and for the next 5 years. Let me tell you, it's so good to have friends who know you like that. After I finally refinished the drawers. 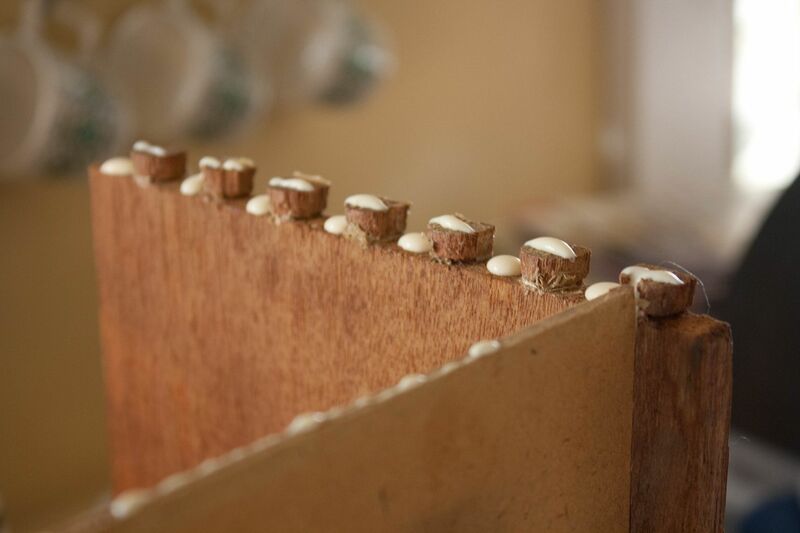 Add wood glue around all the seams. Pop that drawer back together. 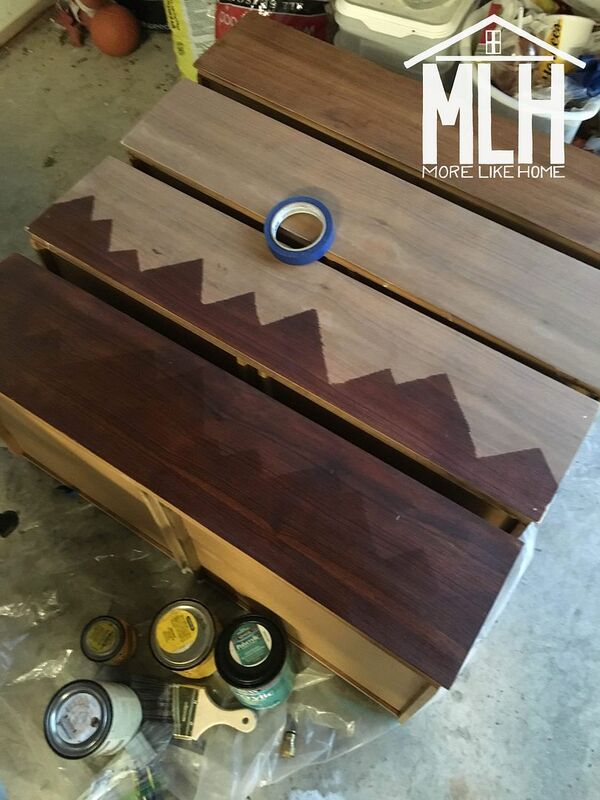 Wipe up the extra glue and add a few finishing nails to help hold it all together. 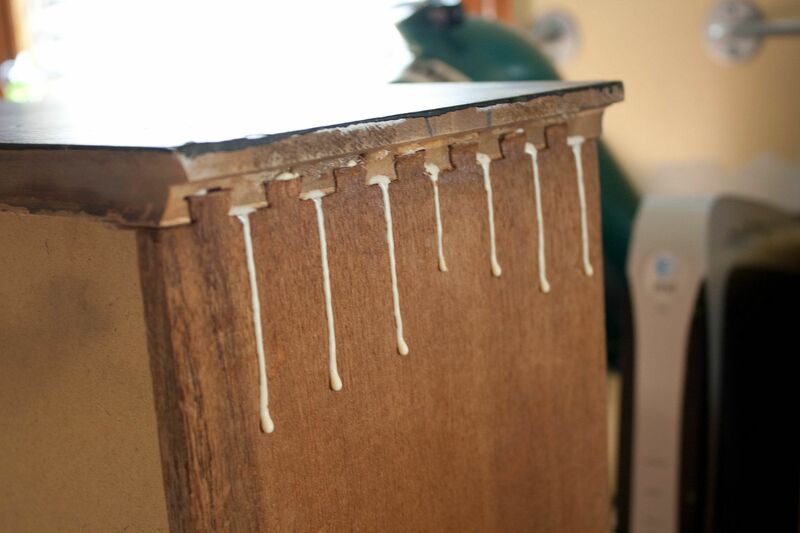 If you have clamps that are long enough, it wouldn't hurt to clamp the whole drawer together while it dries. It only about 5 minutes to get this drawer back together! Easy, right? Now here's my confession: that's as far as I got. For years I moved this handy guy around the house wherever we needed a little extra storage - clothes, craft supplies, you name it. But while it worked hard, it never looked good. Every time I looked at it I thought "Meh. It needs work." But life and kids and time and indecision and... here we are. After our move to Indiana it landed in the basement all but forgotten. In fact I almost got rid of it when I was purging pre-baby. But some deep part of me just... couldn't... do it. Then one day I decided that the small dresser in our living room wasn't up to snuff anymore. 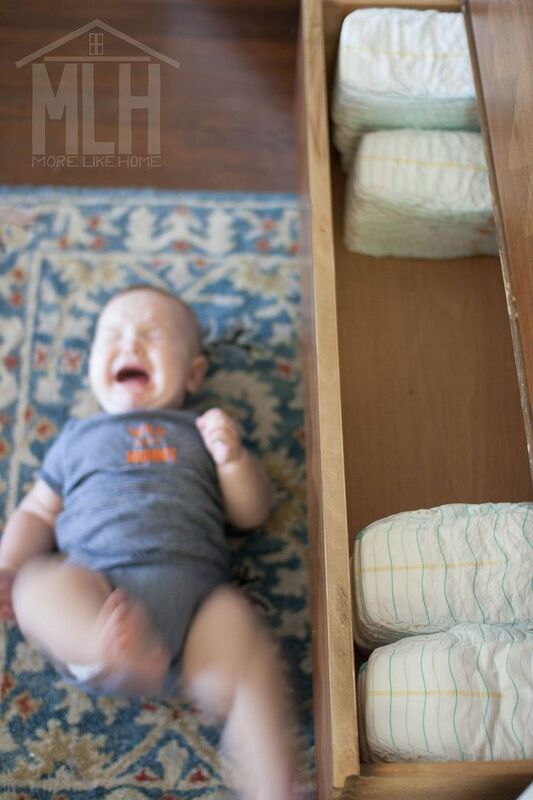 We use it to stash diapers and the drawers were just too small for our now double-diaper duty. 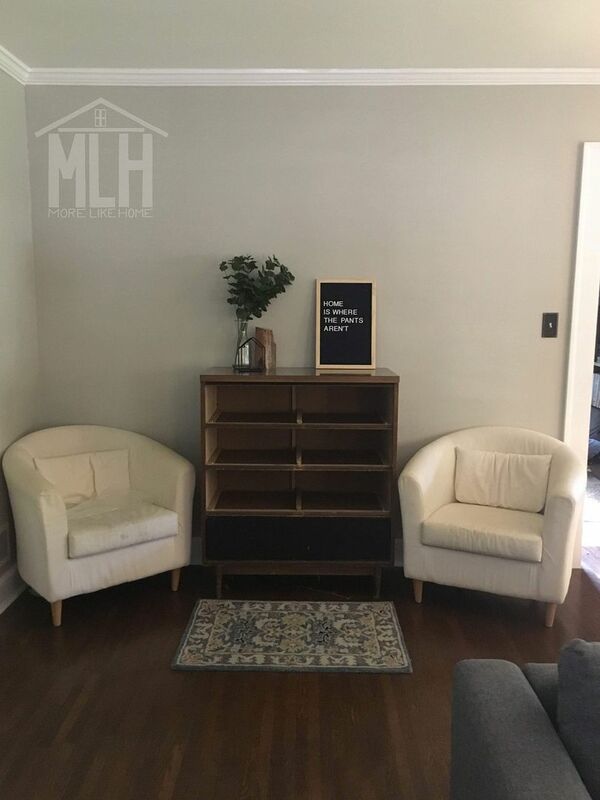 I poured over craigslist looking for the perfect (and perfectly affordable) replacement that would give us a little more storage right where we needed it. 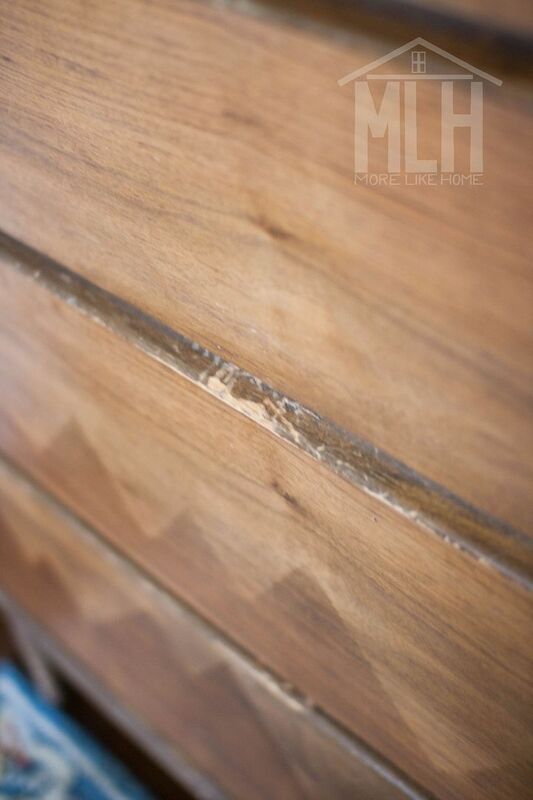 In my mind I pictured an antique dresser with a beautiful wood grain to offset all the new painted-ness in our home. And in my wallet I pictured it was the find of the century for a mere $15. Yeah right. 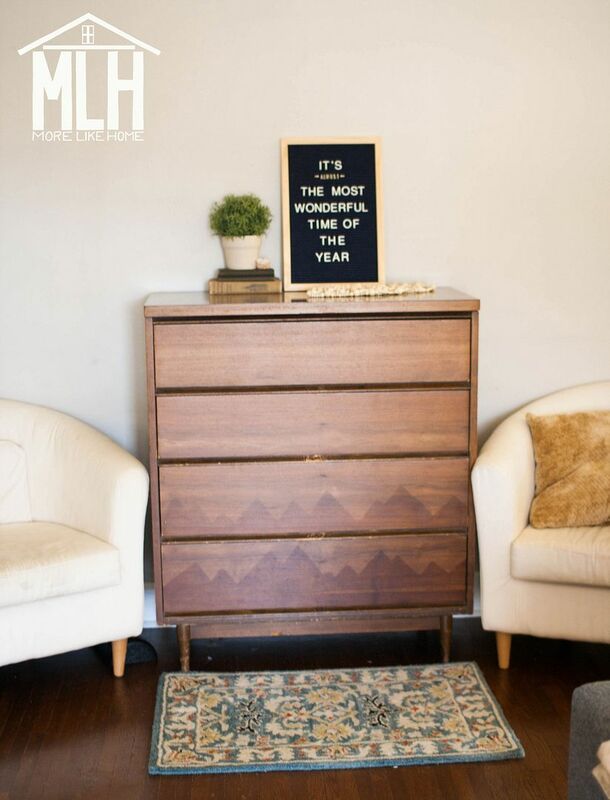 I'm a big fan of dressers in the living room! Or in any room, really. They are the best at storage! But then it struck me - I have a bigger dresser in the basement. It's not what I had in mind but... it just might work. That very day we hauled it up the stairs to give it a test run. Hmmm. That could work... if it wasn't so... ugly. At last, the perfect time had come to give this hard-worker the attention it deserved. 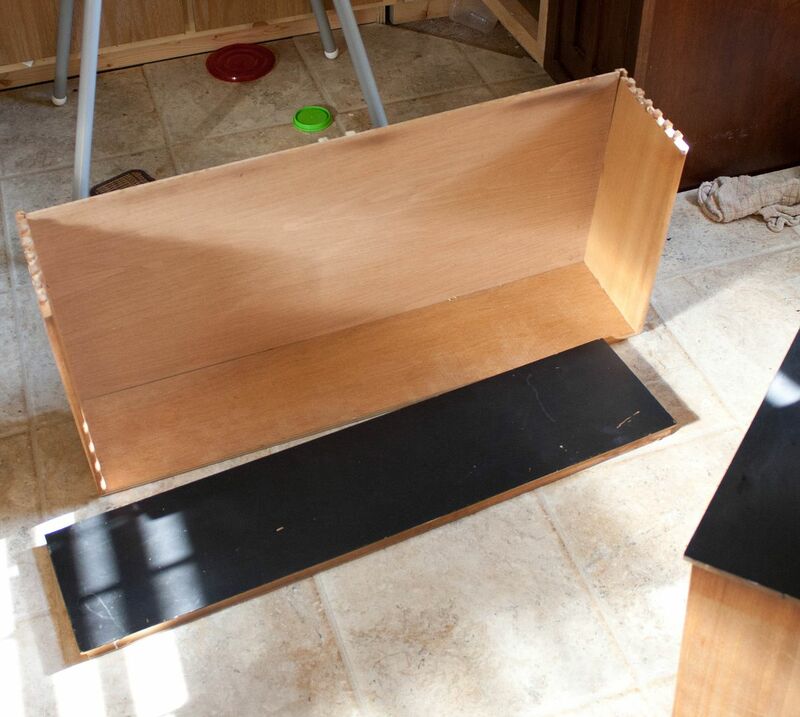 Step #1 was sanding all that black paint off the drawers. And what we found underneath was stunningly beautiful dark wood. 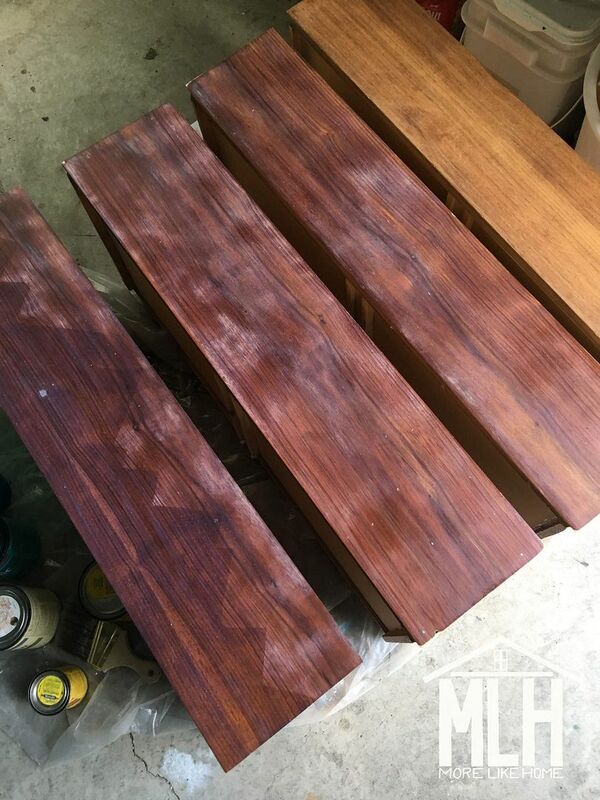 I'm so used to pine that I never expected to find such a beautiful wood grain hidden under all that paint! And it was just what I had been looking for. 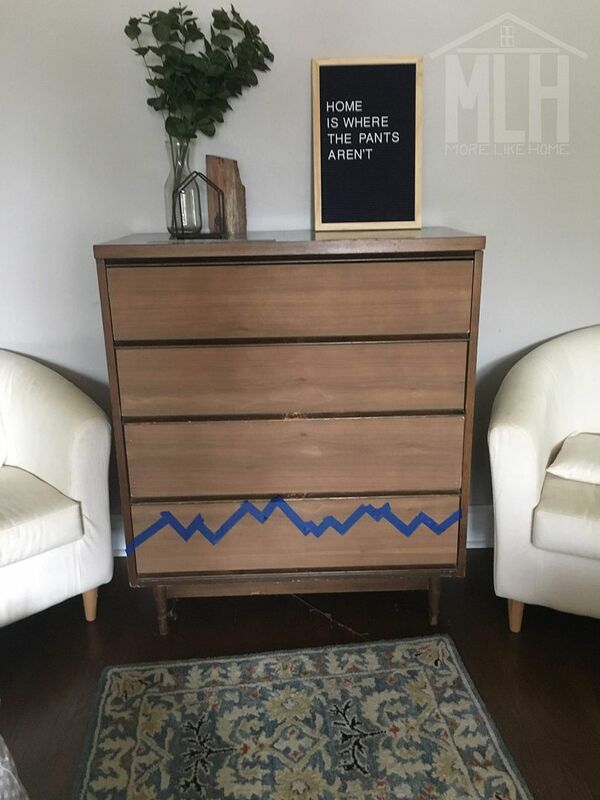 With the drawers in the dresser (so I could see the full effect), I used painters tape to tape a free-hand mountain range along the bottom drawer. Number the drawers when you take them out. 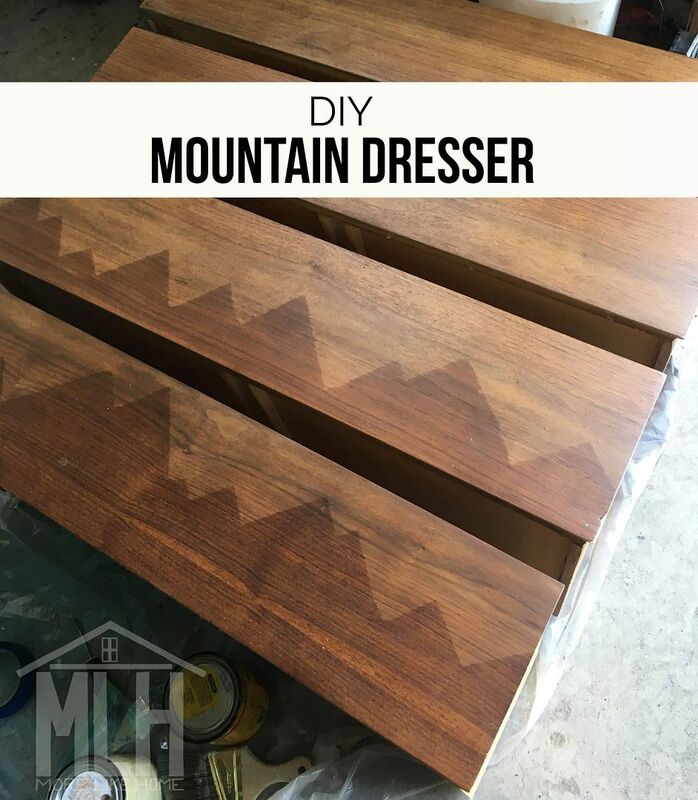 And make sure to do your mountains on the correct drawer. You're welcome. I'll be honest, I was already pretty concerned by the time I pulled this tape off. 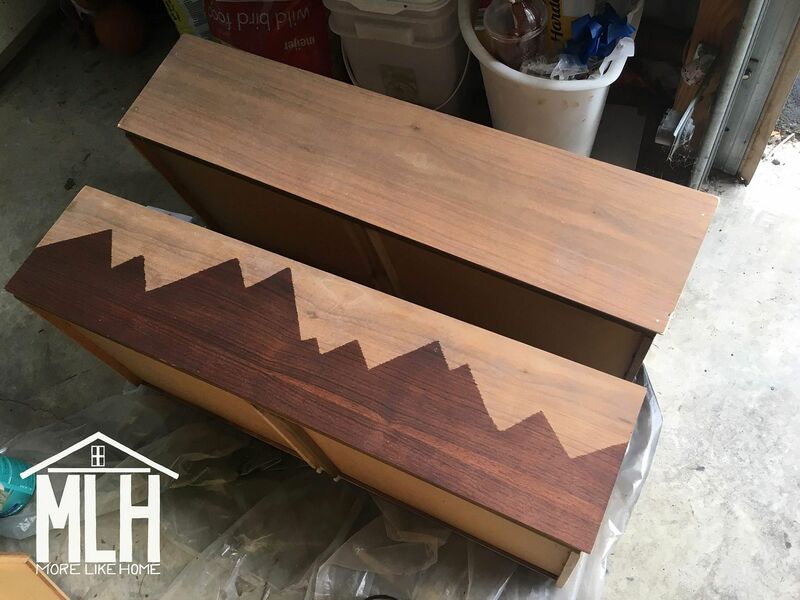 Fortunately I had done a test run on the top drawer before I started the mountain-scape, just to see what the finished product would be after a coat of poly. It did that terrible splotchy trick, then dried beautifully. So I was prepared for it when I got to the bottom three drawers... even if it did still make me sweat a little. And fortunately the mountains got their act together and dried into two beautiful yet distinct shades of brown. We put the drawers back in - which is super easy when they are numbered - and guys... I love it so much. But I think it will be an easy fix. And a fix I'm much more motivated to do now that the rest of the dresser is gorgeous. I'm not great at dressing surfaces, but I'm ready to Cozy-Minimize all over this house so those decorations are packed away while I quite the space. And it might be empty for a while since we're not buying anything this year. 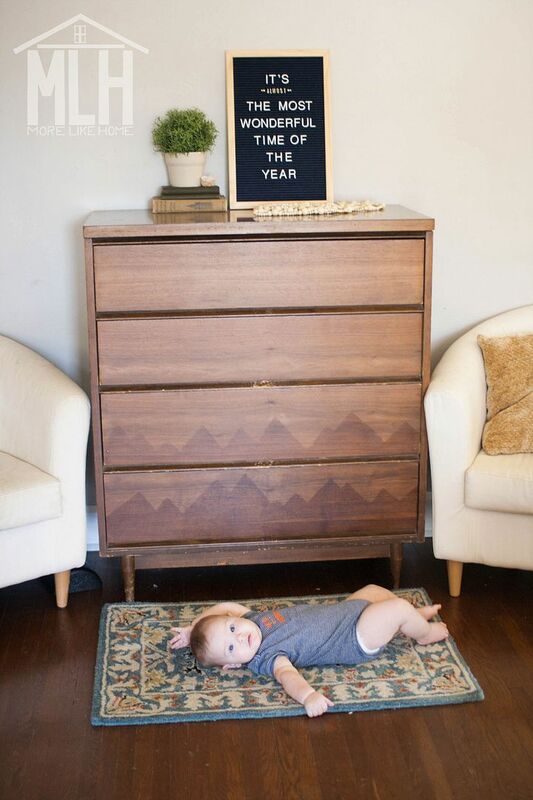 We call this "the diaper change rug" and that's why we put it there. For a cushy resting place on a hard floor. Now you know. Design Mom would be so proud. Enough with the pictures already. 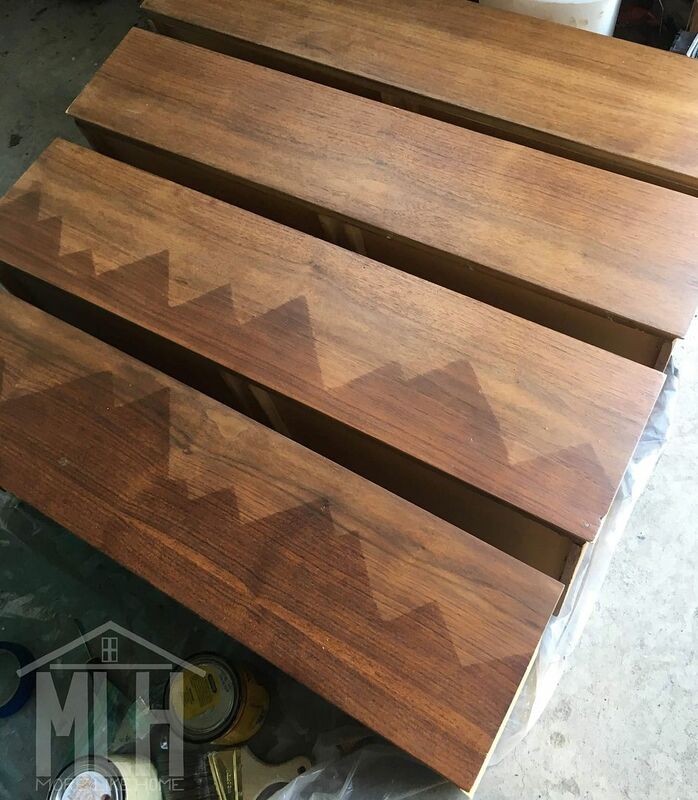 If you're looking for a subtle-but-stunning upgrade for any wood furniture, this just might be your ticket! And you don't have to stop at mountains. You can cut out any design you like from contact paper - a forest of pine trees, flowers, birds, the phases of the moon if you're feeling ambitious. Make it beautiful and make it yours! P.S. It would also be amazing across a wooden headboard. Okay, I'm done. I'd love to see what you make if you give it a try!